Stamp your stuff and make your claim! Your bibliophile friends will never abscond with your favorite tomes again! Simply stamp in your book, and voila! You'll make a lasting impression! Other info: Stamp image measures 1.75" X 2.25". Image/text is deeply etched into our clear polymer to give you sharp, crisp images every time. 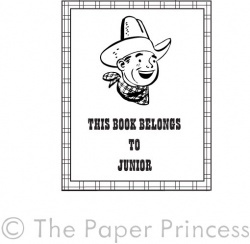 © 2009 The Paper Princess, LLC. All Rights Reserved.